for mega man x v1.1 and the 7th saga. 1. There is a video for my mega man x competition cart. stage paint system you just cant save anything yet. I haven't posted much in the past few years but I have still been working on some things. I still get asked about my work and new patches so I decided to post these for everybody. These are still being worked on just at a slow pace. I have decided to change this wip page from mmx and 7th saga to just a wip page for 7th saga. I still plan to work on mmx and create new things for it. I changed it because I didn't want to clutter up this page with 2 different games. These are all good! Look forward to seeing them finished. Awesome. Keep up the good work. Maybe the screenshots can help. Thanks! Next time I get a chance I'll try to post some pictures. in your favorite tile editor without dealing with the compression. Towns and dungeons also load slightly faster. Check it out and let me know if there are any bugs. 1. Mega man x v1.1 no more passwords only sram. 2. Not sure how hard this is gonna be but I will have active battles in 7th saga like final fantasy 3 snes. Probably going to remove mode 7 from inside of battles to get it set up how I want it to look. Lol this one is gonna be fun! mega man x3 I just don't know how to edits sprites yet for the psx. If there are any bugs let me know. Not sure if redX is still around but I think this was his idea. Him and I or someone else talked about this years ago. I created this patch sometime ago but I just now decided to release it. I hope you 7th saga fans like it. In the readme I show how you can modify the patch for your liking. The graphics decompression thing really sounds awesome. Thanks for that. You're right they should be. I actually have lots of 7th saga stuff that nobody has seen yet. I have new spells, new weapons that can give you magic, new items, a fully working patch that lets you get to level 99, I have separated gold and experience values so the algorithm that multiplies experience x 2.3 = gold is gone(not sure the exact value I'm sure it's not 2.3 but it's something like that), a incomplete editor that lets you view all of the town and dungeon maps, I have new enemies and new spells that were never in the game. I pretty much have the whole game documented. 7th saga is the main reason why I got into programming. Lots of this stuff I created while developing my programming skills. One day or year I will release all of my work when it's ready. The decompressed graphics hack I think I'm going to rewrite part of it but the blue blinking hack I'll probably upload it. The blue blinking hack is kinda cool how it works. The blue blinking patch still needs someone other than myself to test it and make sure it's working correctly. Can you or somebody that knows 7th saga test it out and see if it's working without any bugs? I'll upload it if someone can confirm that it's working correctly without any bugs. When I last worked on the blue blinking hack I found the poorly written asm for the slowdown in the menus and the slowdown when walking around on the world map. I think I can easily fix the slowdown on the world map but I might not be able to fix the slowdown in the menus unless I do a lot of code rewriting because of how the original programmers used the oam ram. The sprite tiles for the menus in oam menus are constantly changing even if you are not moving through the menus and that is the main reason for the slowdown in the menus. The original programmers did not do a good job they didn't even program it correctly for fastrom. It still loads some code and data below $80:0000. It has code that changes the bank to $00 and that's not fastrom that's slowrom. It should be $80 + for fastrom. Can you add any of the enemies from 7th saga 2 also? Not sure if it's expandable to that much... Man that would make for an awesome add-on! Yes I can and I have. 7th saga has tones of room for expansion. There is also a unused enemy in 7th saga 2 that I put in 7th saga. Not sure why that enemies graphics were unused but it's a cool looking enemy. I'm not sure if I have that patch anymore but I could make a new one if you want to see it. Or better yet which enemy from 7th saga 2 would you like to see in 7th saga? The asm for the ai I still have to do by hand but I can probably get a patch together for a added enemy sometime this weekend if you would like to see a enemy from 7th saga 2 in 7th saga. I just won't be able to add the spells or effects that the enemy has in 7th saga 2 because it's a lot of asm work(time) to transfer to 7th saga but I can definitely add the enemy quite easily. Any enemy I add can cast 7th saga spells. 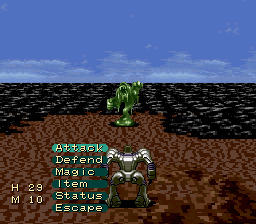 The phantasy stars for the genesis also has enemies that I will add. I did some preliminary testing on the blue blinking patch and it seems to work perfectly . It not only blinks blue if an apprentice is in a town, but it alternates between red and blue if an apprentice is in a town and there is a rune there. I did notice that the town of Patrof does not blink blue even though the apprentice who has the Star Rune is there. It isn't a big deal, but I thought it was worth mentioning. The slowdown seems rather odd. When I play the game using Snes9x Debugger on my PC, the slowdown is clearly present in the item and spell menus when I am on the world map and sometimes when I am in a town. However, when I play on Snes9x for the New 3DS, the slowdown is not present at all. I also have a lot of patches, documentation, etc. for the game that I have not released because they aren't completely finished yet. Since there is still interest in this game, I'll provide some links to them. Showing the unmodified values of the game data to give the user a frame of reference for their changes. Modify sprites, objects, the world map, etc. These documents show every assembly change I have made to the game. It is a little disorganized, but a lot of useful information on the internal workings of the game can be found within. Impressive work Red X! I'm glad you're still around. It looks like we have both improved our skills since the last time we spoke. Do you know any c++? I use QT c++ for my test programs and I can edit all of the features that you want to accomplish except for the text. I never touched the text stuff yet but I should be able to edit it if I looked at the code. With both of our skills we could probably team up and get a awesome editor going. I already have most of the stuff developed for a advanced editor but it's spread over multiple test programs that I just need to combine into one program. "Could not find the main class. Program will exit." And yes, I did try to run the .jar in the executable folder. For the blue blinking that doesn't work for the town of Patrof I don't think he can actually join your party. Can that apprentice join your party? It should blink blue for only when a apprentice can join your party. If I'm am wrong then I can definitely fix it but I think that might be right if he doesn't join your party. I thought it would be cool for it to be a item that activates the blue blinking feature. I was even thinking of making a side quest to get the item. I also have weapons/armor that give double gold, double exp, double attack, % increase or decrease of any stat. 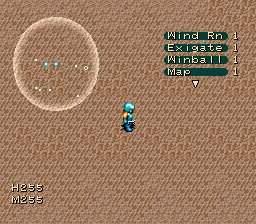 I also created extra space to have more than 3 weapons/armors like in final fantasy 3. With my hack that removed the graphics compression I freed up over half of the ram. That ram was only used for decompressed graphics. There is more than enough free ram now for anything we can think of. Image what we can do with that much unused ram. Open that 7th saga decompressed hack in a debugger and look at how much free ram there is now. It's amazing! Plus all levels load faster since there is no time spent decompressing graphics. Another neat feature that I can create is doubling the vram for 7th saga. The snes only has 64k of vram but byuu made his higan snes emulator capable of accessing the full 128kb vram that the snes CPU was capable of. I already added 128kb vram to mmx1 and it works perfectly. Image how good any snes rpg would look with double the vram for graphics. That is the best unused feature. I'm the only person that I know of that made a snes game use the full 128kb vram. That 128kb vram mmx hack that I made should be posted above with my other stuff. It also has a higan save state vram viewer that shows the 128kb vram image data. Everybody should check that out. I'm sure most of you have heard about the new SUPER NT that is coming out. It should have support for 128kb of vram if not it should be easy for someone to add that feature to it. The snes CPU is designed for 128kb vram. Nintendo just put a cheaper smaller 64kb vram in it to save money. Hopefully the creators of the SUPER NT add the support for 128kb vram. I have contacted them about it but not sure if they will add it or not. Hopefully they do or someone does. Red X I'm curious. What do you think about mystic arks battle system compared to 7th sagas? 7th saga has mode 7 and uses sprites for the enemies and mystic ark does not have mode 7 and uses background #1 for the enemies in battle. I'm actually considering removing mode 7 from battles in 7th saga so I can use background #1 for the enemy sprites. This would allow for a lot of new things like more enemies in battle, more people in your party, and bigger enemies like some of the bosses from phantasy star for the genesis. Is there anybody out there that does great sprite work that likes 7th saga? I looked into the blue light patch further and discovered that in addition to not having the blue light for the apprentice at Patrof, towns will have the blue light even after you defeat all of the apprentices within. Whether these things should happen or not is a design decision that romhackers may disagree on depending on their preferences, but I feel that the patch is fine as it is. After further testing, I found that the slowdown effect only happens some of the time, and it isn't dependent on the emulator used. From the player's perspective, Whether the slowdown happens or not seems random. 1. It could be that you haven't installed java on your computer or need to update it. If you can't run it directly, it is also possible to download the code and open it in the Intellij Idea editor. It has Git support, which makes it easy for many people to work together on the same project. Regardless of the cause I would like to find a way for you to run it because I am interested in seeing what you think about its features. If there is anything I can do to help, please let me know. I have programmed in C++, but I have never made a GUI using QT. I've actually been planning on learning it for some time, but never got around to doing it. I should have no trouble learning it due to my experience with other GUI frameworks. Your work on decompressing the graphics is incredible! In addition to making the game run faster and freeing up ram, this will also make it easier to make a graphics editor for the game. Until now I never considered the possibility of adding side quests, or additional equipment slots because it seemed beyond me. Adding another armor slot for accessories with unique abilities and having players acquire them through side quests seems like a great way to improve the game. For the most part, 7th Saga's text is very easy to understand thanks to Dr. Fail's rom hacking guide on Gamefaqs. However, there are a few characters that are not in the guide. Most of the missing characters are the same symbol and aren't useful. However, there are a few that are complicated because they are used to execute code from within the text. I'm certain that with some help from the romhacking community, the remaining characters can be identified. I played Mystic Ark once, but I quickly abandoned it when I realized that the game is not a true sequel to the 7th Saga. I'll look into it and get back to you on what I think of it. I've seen some videos on the different types of SNES background modes, but I don't have a good understanding of it yet. Although I am interesting in learning these things. I like the idea of creating a small community that works on modifying 7th Saga, but I don't know anyone who likes the game and has romhacking skills. I think that we should make the tools necessary to modify the game, and then look for people to help. However, I don't think that people need to like the original game to be interested in assisting us. I believe that releasing my romhack, as well as supplemental patches related to it may generate interest in 7th Saga from the romhacking community. I haven't played 7th Saga in years but I used to be pretty obsessed with it way back in the day. It's definitely one of my favorite gems on the SNES. I wouldn't mind taking a gander at it's insides sometime. Would sprites from Soul Blazer or Brain Lord be extractable for this also? The apprentice at patrof, can he join your party? So the ram addresses for apprentices in towns are 7e:0737-7e076b and these are what I'm using to make the towns blink blue if a apprentice is there. When you kill the apprentice that value doesn't change and that is why the town will still blink blue. There is another ram address that tells the game if the apprentice is dead or alive and I didn't add that address to the new asm code that I wrote. Good news is I found those addresses. All I need to do is add a check for these addresses and that bug will be fixed. I don't have time today to fix it but I will definitely fix it tomorrow and post the updated patch. You can test out the death bit by putting 0x06 at :073a,:073b,073c that will put lejes at all 3 apprentice locations in the town of zellis. Set lejes death bit 0x80 and he won't appear at any of the locations unset it 0x00 and he will appear at all 3 locations. Should be a simple fix. I don't think I have java installed so that's probably the problem I'm having with your editor. I'll install it tomorrow and see if I can get it working. I can teach you QT c++ programming if you want to learn it. I'm not the best at it and I still have a lot to learn with c++ but I know more than enough to get a fully functioning 7th saga editor programmed. And yea we should definitely team up and get some stuff going. After I buy my house I will be able to to a lot of work into this. I'm trying to get my house before this April. I didn't know you liked 7th saga that much. Ever since I first played it as a kid it was one of my favorite snes games. I know it's definitely not one of the best games for the snes but I definitely liked it a lot. It has flaws but it has a great foundation to become one of the best snes games. I always thought the developers could have done more with it. Seems like they just wanted to push the game out quick. It you, Red X, and I worked on this game we could really make some huge improvements to it. Yes, any sprites from any game can be added to 7th saga. I have all of the data figured out to be able to do it and I can program the tools for it as well. I just need to put all of my tools into one program. Now there are limits to the size of sprites that you can add. With the enemies you are limited to 12 32x32 tiles and each party member is limited to 4 32x32 tiles. In mystic ark how the use the background #1 for enemy sprites the enemy tile have a limit of 16 32x32 tiles. This is another reason why I would like to remove mode 7 from battles in 7th saga and have it to where background #1 is used for enemy sprites like in mystic ark. There are bosses that are in mystic ark that are 16 32x32 tiles and you will never be able to put those in 7th saga unless mode 7 is removed. I will eventually remove the mode 7 to test things out and see how the gameplay is but that is going to take some time before it's done. I have some work done with that hack already and I did remove mode 7 but the programming is not perfect yet. I still need to gather all of the battle system asm codes and rebuild the entire battle systems engine for it to be perfect instead of a half a$$ job. I'm off to work I'll post some more stuff tomorrow night with the updated blue blinking patch. Once all of the bugs are worked out I'll upload it to romhack.net. I always thought a great idea for a hack on this game would be where it takes place before the time where you go into the past and play in that time line where it is unaltered. Also with how it uses some references to Brain Lord, maybe even use some of the GFX from that to recreate some of those levels somewhat. The apprentice at Patrof does not join your party. The game forces you to fight and permanently kill them in order to obtain the Star Rune. When I mentioned how the apprentice at Patrof does not trigger the blue light, and a defeated apprentice does, I did not mean to suggest that these events are bugs. I thought I should mention it because there are advantages and disadvantages with either choice to these scenarios, therefore I thought it might be best to allow the patch to be easily modified to support all options so that each romhacker who downloads the patch can choose which way they want to implement it. Personally, I am happy that the patch exists at all. I am grateful that you took one of my oldest ideas for how to improve the game and made it a reality. I think the current patch handles these scenerios fine as it is. The Patrof apprentice being there is known to anyone who has played the game before. Having that apprentice make the town flash blue would hide whether any other apprentices are there. This makes the blue light lose any meaning until the Star Rune is obtained, which creates a gameplay inconsistency. However, not activating the blue light means that the crystal ball doesn't always tell the player if a fellow apprentice is in a town, which creates a logical inconsistency. I feel that gameplay consistency is more important than logical consistency. It is for this reason that I prefer the patch as it is. Whether defeated apprentices should activate the blue light depends on whether the player wants to know which towns have apprentices at all, or whether the player wants to know which towns have apprentices they can interact with. Although I have a slight preference towards having defeated apprentices activate the blue light, I am uncertain which method is actually best. What do you think about this? I am glad to hear of your interest in the 7th Saga. I have always been impressed with your Megaman X3 Zero Project, and still look forward to its final release. If there is any particular aspect of how 7th Saga works that you would like to know more about, let me know. There two general purpose resources that may be useful to you. This resource shows many ram addresses and math formulas that the game uses for its battle mechanics. This resource shows the location and contents of many of the tables in the game. I wouldn't mind getting together in a message or something and brainstorming ideas to improve, enhance or expand the game or something. That's more my forte when it comes to these kinds of things. I think the apprentice at Patrof that has the rune but doesn't join your party shouldn't make the town blink blue just because I think the blue blinking should be for apprentices that can join your party. I also think the apprentices that are killed should not make the town blink blue. I have fixed the towns blinking blue for dead apprentices. The towns will no longer bling blue if they have been killed. The new updated patch is posted below. Just need to test it to see if there is any other bugs. I was able to test out your editor. All I had to do was install java and it worked. The editor looks good! It edits everything or almost everything that is in dr fails guide. I also have something similar that I have written in QT. I tried to find my test editor that displays all of the town and dungeon graphics but I lost it inside one of my hard drives. I'll probably write another one soon with some extra stuff added. I do have a editor with a paint system that can decompress and edit 7th sagas graphics then compress the graphics back into 7th saga using the same compression format. All of my editors were just for testing and developing my skills. Now I just need put them all together and add a tile editor for maps. I really need to redo my decompressed graphics patch before I start building my editor. I'm not really happy with the patch I can write it better and I will. I would definitely like to hear your ideas that you come up with. I think if the 3 of us work to improve 7th saga we could really improve the gameplay a lot. The 3 of us can handle the programming but I think it would be cool if some talented spriters would jump on board we could definitely bring their sprites to life. I have never played with any type of music hacking and I'm not even sure how to write a music editor but that is something that we would also need to figure out. I can do some sprite work but the music is out of my league right now. What improvements do you think could help 7th saga? I have good news. I have created 3 new patches and I figured out how to upload images from my phone. This patch fixes the bug for the blue blinking towns when the apprentices are dead. It also has a temporary workaround for the slowdown in menus caused by poor programming by the original programmers. In the menus you usually have up to 6 items that you can view at once but I have changed it to 4 and now there doesn't appear to be any slowdown in menus. I will eventually rewrite the asm code for the menus but this will have to do for now. I think it's a lot better like this than to have that slowdown. If you want to change the menus back to having 6 items here is the data to change it back. the uncensored Elnard graphics back into 7th saga. You must apply both patches for it to work. Here is a pic of the graphics that were added back into 7th saga. This patch adds the monster green slime from mystic ark into 7th saga. The green slime has all of its own data and ai. And all other enemies are still in the game. The green slime uses the empty hex value of 0x01 for its data. This patch also needs my beta graphics decompression patch for it to work. It will not work without applying that patch first.